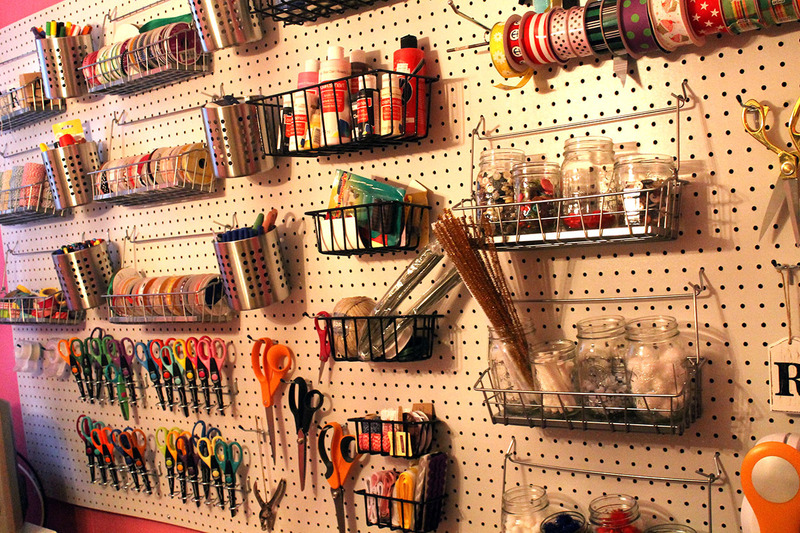 When we purchased our house, I immediately eyed a small room in our basement for my craft room. I was so excited to have a place to put all my craft belongings! It isn’t a large space (about a 10 x 10 room), but it’s ALL mine…even my girls know to ask permission before going in to borrow something for a school project. For the first five years that we lived here, I just had a work table in the room and boxes and bins scattered everywhere. Last summer, I finally transformed and organized the room into a functional space. 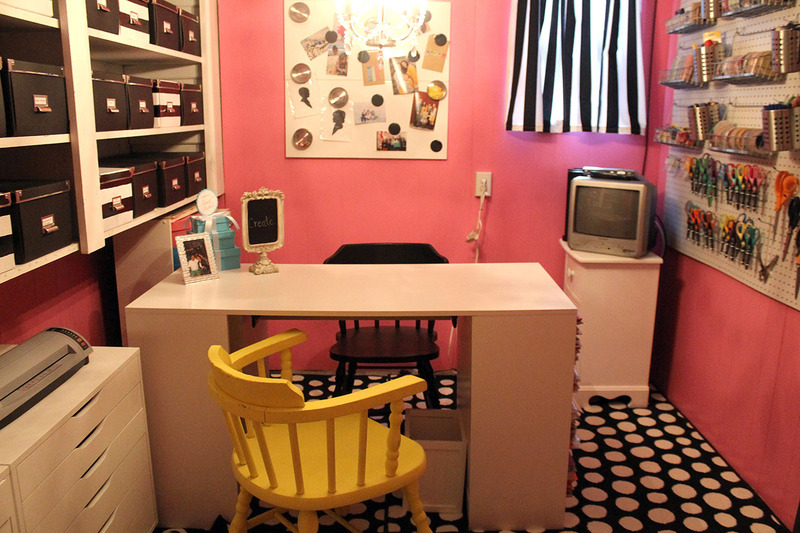 I started by painting the walls a bright pink…a color that always inspires me and brightens my day. I had a pegboard hung on one of the walls. 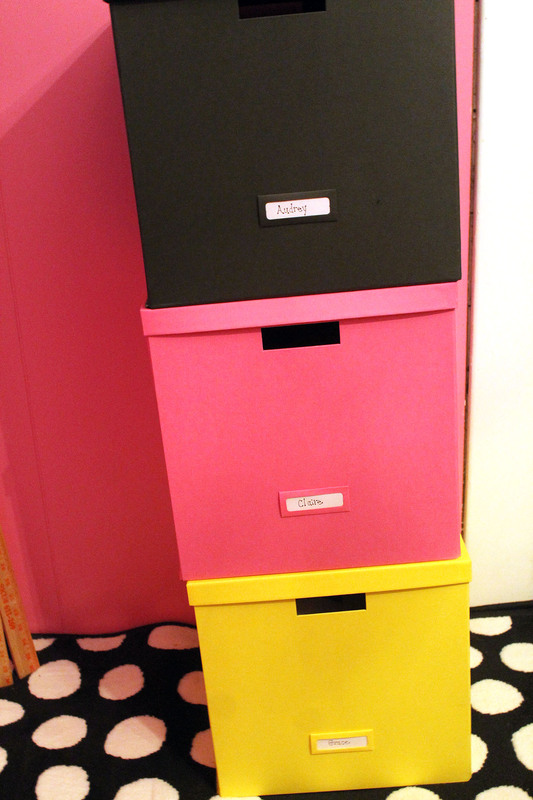 This was the best thing I did in the room because it allows me to have so many of my craft supplies in plain sight. 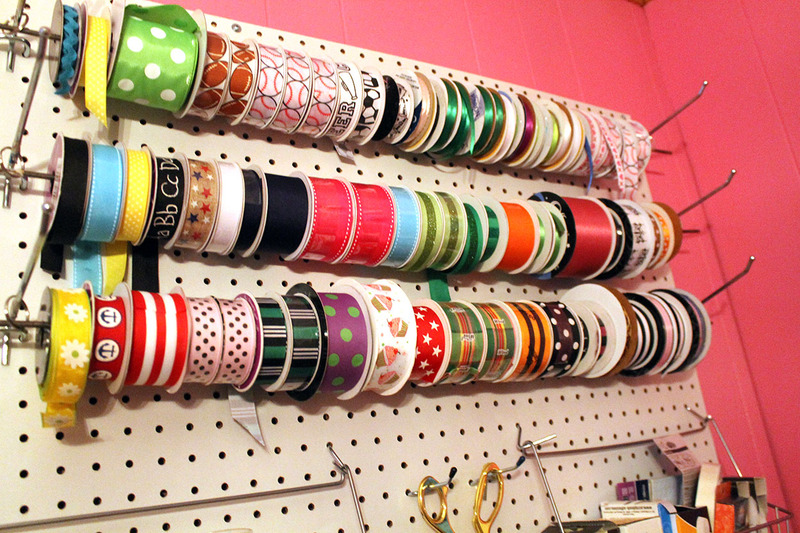 My husband came up with this idea to hang all of my ribbon. It is a great solution that allows me to unroll just the amount I need when wrapping a package. 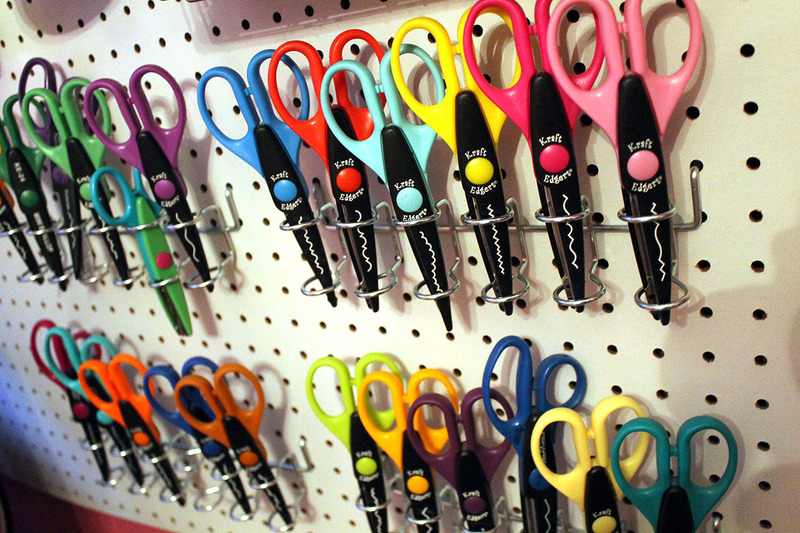 I found these pegboard accessories at Home Depot, and I thought they would work great for storing all my various scissors. These metal baskets came from Ikea, and I use them to store my washi tape, smaller spools of ribbon, adhesive tape, baker’s twine, and rubber stamps…among other things. 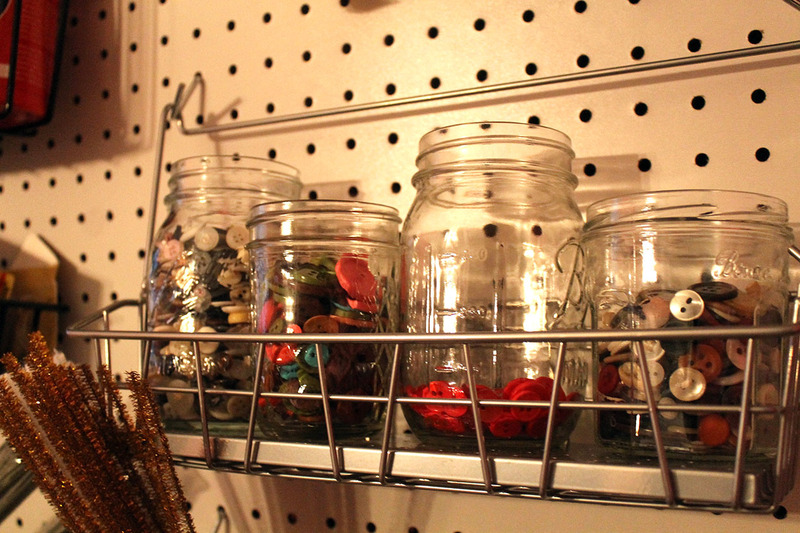 For smaller items like pompoms and buttons, I placed them in mason jars within the metal baskets. 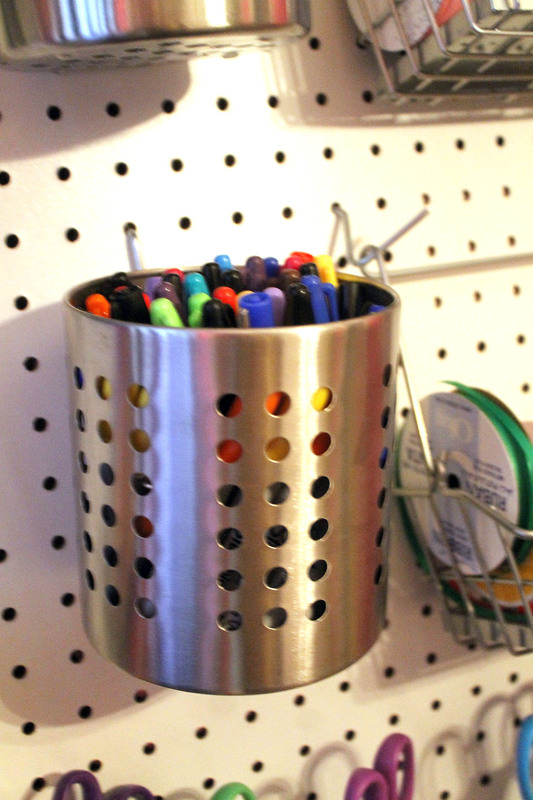 The metal cups (also from Ikea) are great for storing pens, Sharpie markers, scrapbook pens, and fabric markers. The wall opposite the pegboard had shelving with cabinet closures. I removed the cabinet doors so that the shelving is exposed. The cardboard boxes are from Ikea…no surprise there (they sell the best items for home organization). 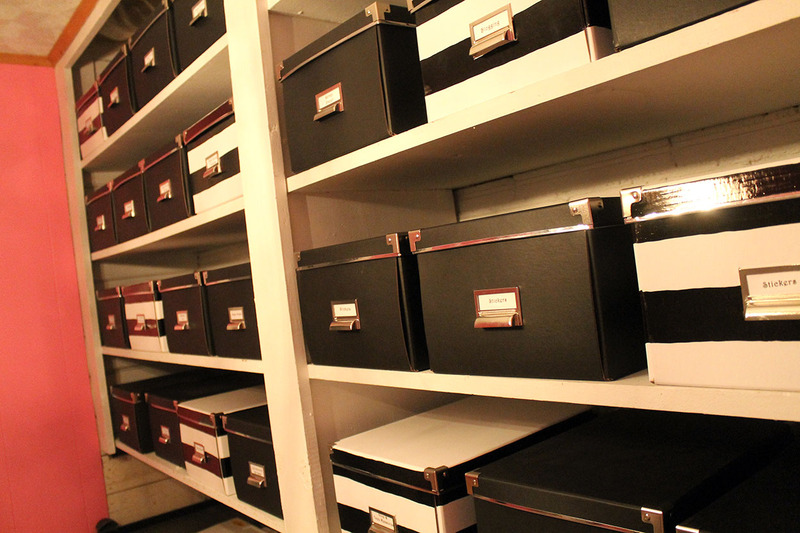 Every box has a label so I can easily find what I am looking for. I have three larger boxes stacked near the corner by the door. I use them to keep important school papers, artwork, certificates, awards, and memorabilia for each of the girls. I keep telling myself that one of these days I will update their scrapbooks! 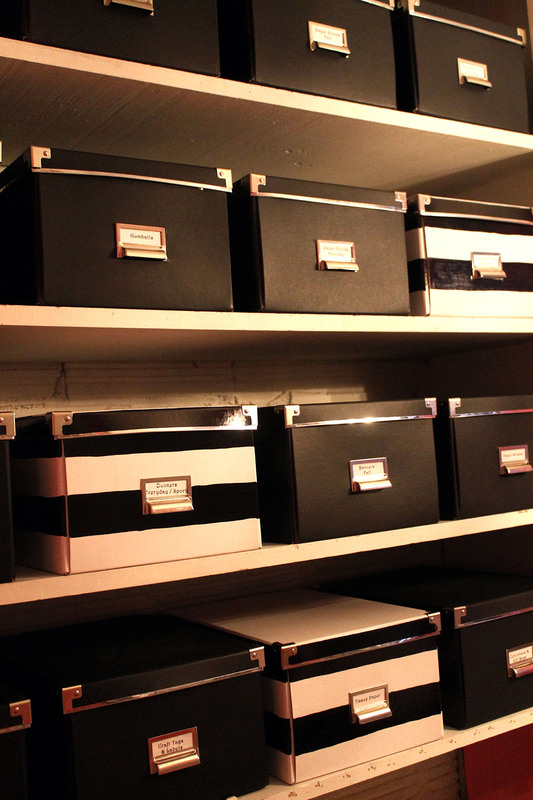 Below the shelves are two sets of storage drawers on wheels. 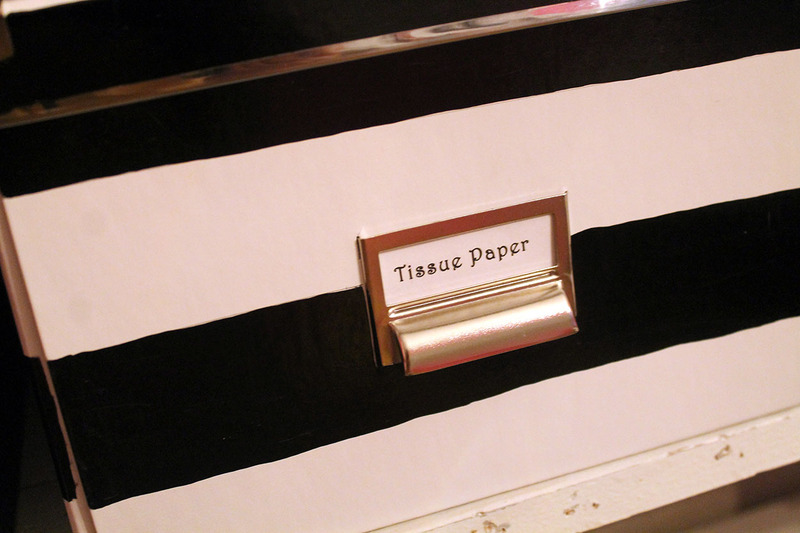 I store scrapbook items and paper in those. 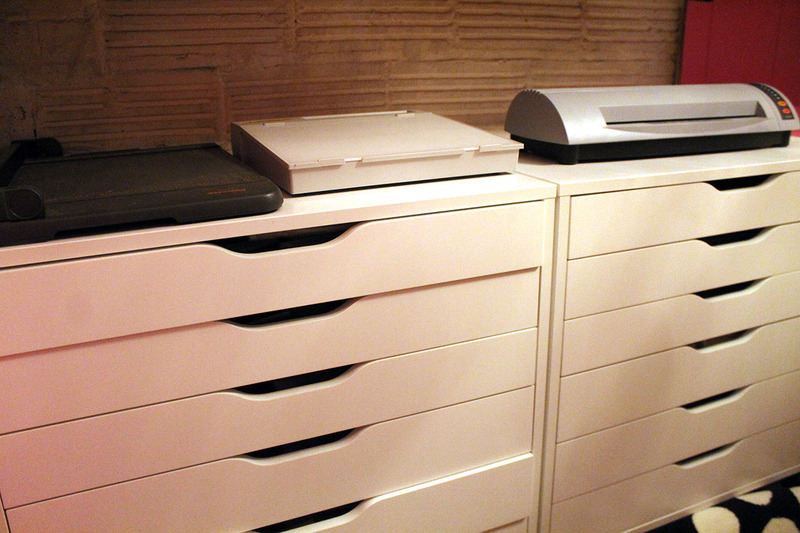 On the top are my laminator, large paper cutter, and light machine…all within reach. 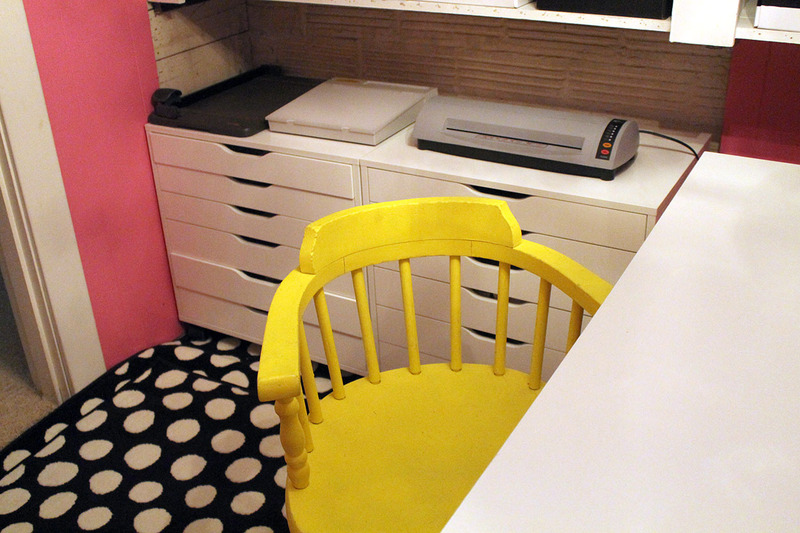 In the center of the room is this great work table with drawers and side shelving. I keep a chair on both sides of the craft table, in case I have a “tiny crafter” working with me. It took me weeks to organize and decorate this small room, but I’m so glad I did. It is a bright and cheery space where I feel inspired and creative! Thank you! 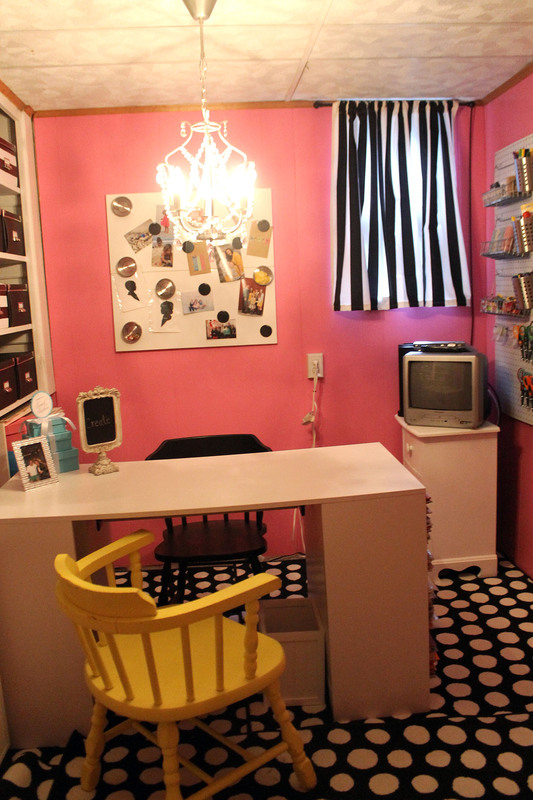 I love that room…favorite one in my house! Amazing. Really, Beth, this is so cool. You need to teach classes! Thank you! Thinking about spinning the blog off into something more…classes, workshops, my own Etsy shop…just not sure of the route. I need you to be my business manager!!! 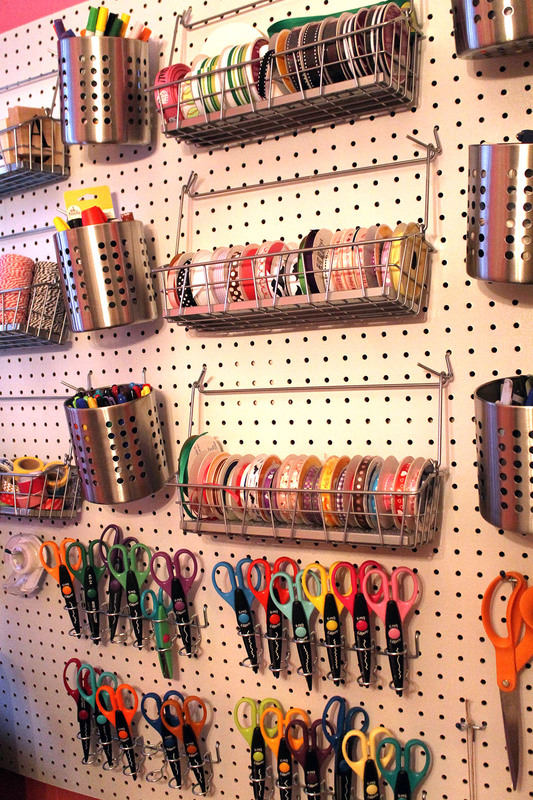 I came across your ribbon storage pegboard setup. 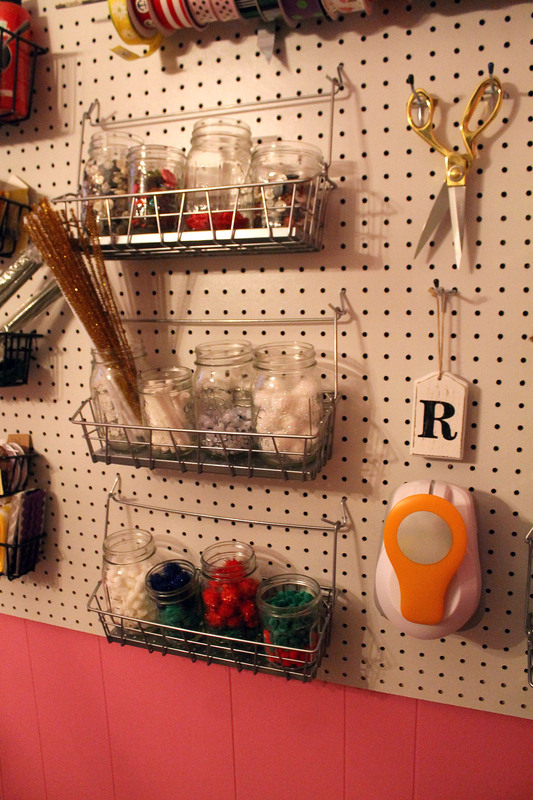 I am curious to know how the ribbon spools are on your pegboard. I can’t really tell from the picture how the spools are held. Thank you. Sorry for the delay in responding…I took a break from blogging this summer, and just now came across this comment. Anyway, I used straight hooks for pegboards (I think that’s what they are called) on both sides. Then I placed all my ribbon spools through a straight metal rod. If I remember correctly, my husband had Home Depot cut these to size. The rod is attached to the straight hooks with small circle metal rings (similar to what you see on keychains) on both sides. Hope that helps!